Sep 08, 2016 Hello- There are many different factors that go into the price of LeafFilter such as inside and outside corners on your gutters, number of stories on your home, whether a gutter replacement is necessary, and if a rake metal is needed for our product to perform at its optimal level. If you have further questions about why a rake metal was used or are experiencing any issues with the gutter guard system, please contact us at 800-749-4566. I’m writing to express my regret at ever having LeafFilter work on my home. I will take a few minutes and detail my experience. After attending the Everett Home and Garden Show, I contacted LeafFilter for an estimate. The sales rep came out and gave his sales pitch. He measured and came back in with an estimate. I couldn’t afford to have my whole house done. I chose to have the front gutter (my biggest problem area) and two short gutters in the back that weren’t installed correctly fixed and fitted with LeafFilter. The sales rep informed us that our house didn’t have rake metal installed and without it our roof/eave area would become compromised over time. We would end up with lots of damage that would need repair. 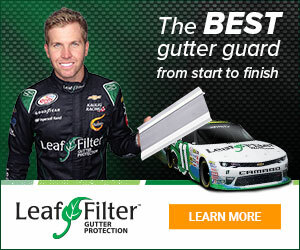 He said that LeafFilter can remedy that by installing the rake metal for an additional $600 when they send out their team to install the LeafFilter system. Our total bill was $2516.11. The approximate start and completion date was March 20,2013 between 12 and 2 pm. On March 20 after noon, a man (not a team) shows up from LeafFilter and starts work on the house. He doesn’t leave until after 6pm. He had completed the front gutters, started on the two short gutters, and started on the rack metal. The weather was horrible and he was fighting it every step of the way. He was also fighting with the rake metal that he was given to install. To install the rake metal the installer was taking out at least the last nail on every shingle to slip the rake metal in all around the house. To my untrained eye the rake metal didn’t look correct and I wasn’t thrilled to see all the roofing nails coming out. It appeared to be too wide. He said it was and he had to cut about 3 inches off all the rake metal to fit it properly. He called the installation supervisor. He was on speakerphone so he could keep working. The person he was speaking to said to cut it down and make it work. He came back the next day and worked under similar conditions. He ran out of rake metal. He called and again told the installation supervisor that the product he was installing wasn’t correct. It must have finally got through to the supervisor because he told the installer to take every piece of rake metal out that he had installed and he would have to come back with the proper rake metal another day. We stopped him when we found that he was pulling it out. Part of the job was that he installs the rake metal and use a 50 year silicone to seal it. The installer had yet to silicone anything and he was pulling out what he had installed. We didn’t know when he would return and all of the shingles where he had slipped the rake metal in were not secure. I called the sales rep and asked for help in getting this resolved. The sales rep told me that he had been informed that the sub-contractor they hired to do the job wasn’t doing what he was supposed to. I let the sales rep know that what he was saying was incorrect. I have nothing but admiration for the installer. He was working alone, in horrible weather, attempting to install something that was incorrect. I let the sales rep know that I wasn’t “happy” at the thought of every shingle on my home exposed. The sales rep assured me that everything would be fine. It would be completed the next day. The next day was Friday, March 22. It snowed. I didn’t expect anyone to show up and no one did. I called the sales rep to ask when someone could be scheduled to come out. He said that Saturday, March 23 was going to be clear and someone would be out. We stayed home because we needed to be here. No one showed up. I called the sales rep on Monday, March 25th. He wanted to schedule someone to come out that week. I let him know that wouldn’t be possible because our schedule was full. (We shifted everything we had planned for the 21st, 22nd, and 23rd to the week of the 25th.) I let the sales rep and the supervisor know that the only day we had open in the near future was Monday, April 1st. They agreed to that day. On the 1st, a man shows up, a different installer. I introduced myself and filled him in on what had been done to that point. He told me that he was told that to finish this job it was going to take an hour and a half. I apologized to him and laughed because I knew that it was going to take longer than that. Four hours later, he comes to me and says that he has another job he has to go to and that he would be back to finish up. He didn’t return on that day. The installation supervisor called me asking to set up another day when they could come out. I was taking the week off for vacation to do personal business and maybe get away for a couple of days with the family, but because this had been dragging on for so long I just wanted it done. I apologized to the family and let the supervisor know that they could come on Thursday, April 4th. He assured me that the work would be completed. He said that he would be out and work on the job personally. He said that he would be here at 9am. On the 4th at approximately 9:40 am he appears. He introduces himself and gets to work. A little after noon the installer who had been here on the first arrives to help the supervisor. They took all the rack metal that was wrong and removed it. They put in the new rake metal. They pulled out more nails. When I asked if they were going to replace them, the supervisor told me that the whole roof was installed improperly. He said that we needed to get a roofer out and look into replacing the roof. They finished the job at approximately 6pm. I saw them put silicone on but I couldn’t see where it did any good. I contacted two roofing companies. I was told, by professional roofers, that the only thing wrong with my roof was the fact that LeafFilter took out nails that didn’t need to be removed. I was also told that the way my roof was done the rake metal was not needed. I let them know how much I paid for it was told that IF I felt the need for rake metal they would have installed it properly for half the price. They would have also referred me to a reputable gutter cleaner that would have come out and cleaned all of the gutters (which LeafFilter said they would do and didn’t) for probably more than 10 years at the price I paid for the LeafFilter system that I had installed. We needed to get the roof fixed. The roofers told me that all the shingles LeafFilter worked on needed to be re-nailed. They also let me know that some of the shingles LeafFilter messed with were curling and needed to be secured with Henrys’. I paid the roofers to re-nail. I will have to get on the roof myself to secure the curling shingles when the weather gets warm enough to seal them. I contacted a home inspector and had him come out to look at something in my attic. In his inspection he asked why we had rake metal. I let him know the story and he also confirmed that it was a waste of money. I am a woman in her fifties raising two children with the help of her elderly mother. One of the children and my mother has health issues. I work full time and with everything I have to do I look for anything that will help out and ease the burden. I feel that I was taken advantage of by LeafFilter. I do like the gutter system but I don’t like the fact that I got sold on something I didn’t need (the rake metal). I question the knowledge of Mr. Plante and the installation supervisor. I’m just glad that I wised up and hopefully will take a step back and look for other options before I spend the money in the future. Would I recommend LeafFilter? No. Have I told people about my experience? Yes. Review #342232 is a subjective opinion of firebird1959. I hit the BS button by mistake ...sorry! As an update to my original post. No one from Leaf Filter has bothered to respond to any of the comments I've made here or elsewhere. I have roof shingles that are curling because Leaf Filter didn't do a thorough job on their installation (not a surprise). I will have to climb up on the roof and fix it since I can't afford to have someone come out and do it for me. I'm not looking forward to doing that.